The Hunger Games is a dystopian story about a yearly contest where children are forced to murder each other for the entertainment of others, which is not your typical Hollywood affair. Adapted from the hit novel by Suzanne Collins (the first of three), the film is directed by Gary Ross and stars Jennifer Lawrence as Katniss Everdeen, a girl who volunteers to participate in order to save her sister from the brutal tradition. Since I approached the material cold, I thought I’d invite my close friend Mira John on to discuss it with me. Mira isn’t a film critic, but knows her stuff when it comes to these types of film adaptations. She loves the books for The Lord of the Rings, Harry Potter, and now The Hunger Games. Since she was well versed in the universe of the novels, I did a chat with her after to get a sense of how those who love the books are viewing the next big Hollywood franchise. Please note that we discuss spoilers for both the film and the novel. This talk is intended for those who have seen the film or don't care to have the ending ruined. Peter: Hey Mira. So we saw The Hunger Games today, adding our $20 to the $155 million it made this weekend, making it the highest grossing non-sequel opening of all time. Now I've never read the novel by Suzanne Collins, while you've read all three. So my first question is how did you enjoy the movie? Mira: I enjoyed it, though I haven’t decided if it was worth all the hype. But it was fun. I'll probably watch the next movies whenever they come out. Mira: Yes, but probably for different reasons. Peter: Now here's a question that's been bothering me: are the books as serious as the film made it seem? Mira: I would say that the books are more serious. Peter: I'm thinking about when we first get to the Capital, which is this certainly epic moment, but never really awe in the same sense you get with say, the Harry Potter series. I guess for me the Capital is supposed to be this wondrous place, and I was kind of dumbstruck by the visual style. I'm still trying to figure out a world in which that type of fashion would be considered beautiful, and the buildings itself seem like a mishmash of typical dystopian films from the last decade. Mira: I think that's the idea—in The Hunger Games universe, the 12 outlying districts are slums or backwater areas, whereas the Capital is supposed to be this highly modernized, opulent, and decadent city. Since this story supposedly takes place in the future after some unknown disaster wipes out North America/ the US/ the world as we know it, it makes sense that the filmmakers would try to give off a dystopia vibe. Peter: Right. Though the radiation has had some serious effects on Wes Bently's moustache. Mira: Any place that forces its districts to give up children to fight to the death every year isn't exactly a warm fuzzy utopia. But part of the Capital's opulence is that its citizens are well, ridiculous. Mira: You saw Wes Bently's character and Elizabeth Banks’s—they live in a pampered society that only cares about looks and entertainment—entertainment in the form of extreme reality TV. It’s pretty obvious stuff. Peter: The only part that I found hit something of note in the satire was Stanley Tucci's American Idol inspired show. Does Collins get further in this in the book? Mira: That was my problem too. The book is actually a lot more biting and critical. I was hoping the movie too would explore that further like in the book. The character Cinna (played by Lenny Kravitz), who is Katniss's stylist is a lot subtler. The reader can't immediately read him or his agenda but once Katnis does figure out his motive the contrast between him and everyone else in the Capital couldn't be starker. Peter: Yes, I was certainly hoping for more of him. Mira: His character is very watered down, which is a pity—he's one of my favorites. 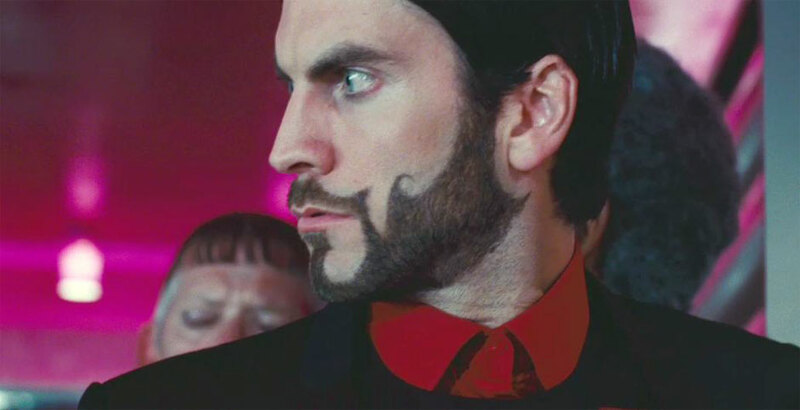 I also noticed that they boosted up Stanley Tucci's, Wes Bentley's, and Donald Sutherland's roles a great deal. You only get a few glimpses of them in the novel. 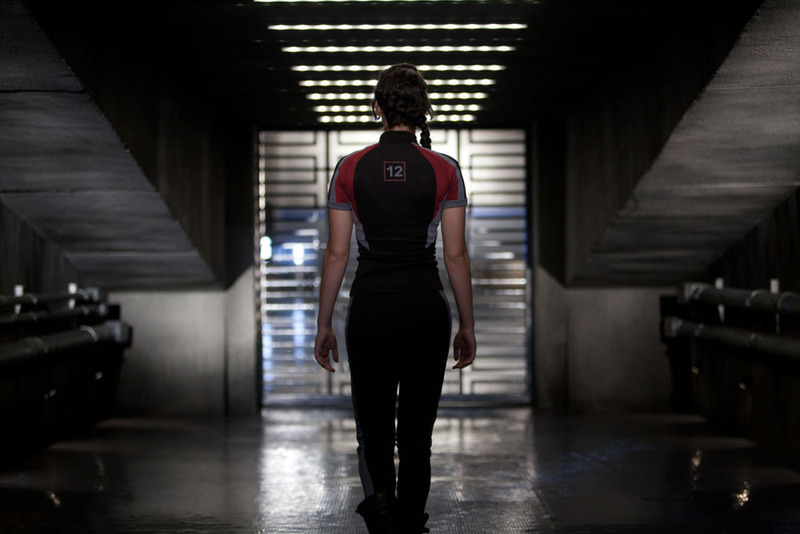 Granted, the book is in Katniss's perspective, so she wouldn't know what's going on behind closed doors. Since it's a Hollywood film, you have to expand the roles of the more seasoned actors, I guess. Peter: I enjoyed Tucci a lot, because I think it's one of those fun roles he can play with. And I'm assuming once we get to the sequels we'll see much more of Sutherland, who came on screen a lot but I never really understood what his motivations in anything were, except for the skin deep metaphors monologues. Let’s get to the actual games, which aren't really that brutal! Which I guess you have to do in a PG-13 movie. Mira: I think they could have done more and still keep the rating. But the handheld camera shaking…I was not a fan. Peter: Oh it drove me insane. I think especially during the final fight sequence, I had no idea where anyone was in relation to each other. Peter: I don't mind shaky cam in films like the Bourne series, but I didn't understand why it was used here. Mira: I guess to make it feel more gritty? The games were a hard thing to pull off , because they move more slowly in the book too. Peter: For the most part I think I enjoyed the games part more though. Mira: I did like how they downplayed the Peeta-Katniss lovebirds bit, but again, they wasted an excellent opportunity to critique reality TV. In the book, Katniss is always thinking "ok, I need to do this to get audience support,” or “Peeta is dying; we need all the help we can get." Peter: Is there more stuff with sponsors? We hear about all about it, but then we see…two care package? And that’s it. Mira: Yes. There's one scene in the book where after Haymitch gives the "you call that a kiss" message. I can't remember if it's in the form of a care package, or if Katniss doesn't receive a package and later realizes that's probably what he's thinking, so she kisses him for the first time later and it's very romantic and caring. After that, a package arrives and Katniss imagines Haymitch going, "that's better..."
Peter: That's much more interesting than what we get. Here it seemed like they actually cared for each other and were simply star-crossed lovers. Mira: Yes. Collins plays with that too, because they do really care about each other, but Katniss can never tell whether she cares for him in a romantic or platonic way. She has to pretend to be madly in love with him, but by the end of the book, she finds herself wondering what exactly she actually does feel for him. Actually, the book ends on a very ambiguous note that was not shown in the movie. As they’re going back home, Haymitch tells them that they can drop the act. Peeta goes, "What? 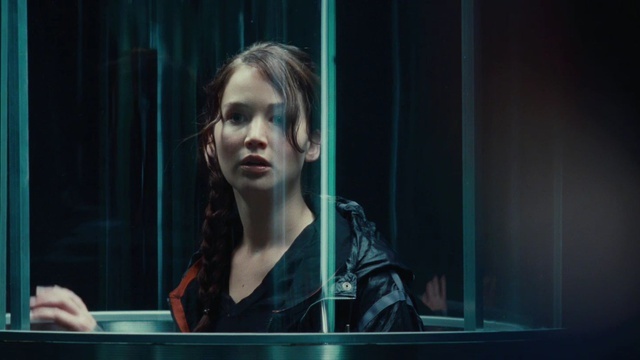 I actually do love her," whereas Katniss's response is more like, "err....." She then explains to him the "ruse," which naturally hurts him and then realizes that she doesn't actually know where she stands. It seems... watered down in the way the movie ended, especially with it ending not with the victors but with Sutherland. Peter: Certainly; it felt like a pretty feel good ending, and then necessary sequel setting up, with the ominous Sutherland, creeping in wherever he goes. Let’s talk performances—what did you think of Jennifer Lawrence? Mira: I liked her. She did a great job with what she was given. Peter: She was my favorite part. I loved her in Winter's Bone two years ago. She's excellent at really keeping things internal, while still showing a running fear under her cold exterior. I also really liked the casting of Josh Hutcherson opposite her, who is so feminine in comparison to Lawrence’s somewhat masculine edge. He's not the best actor, but I think he was well casted. I think he has an awkwardness that really works. However, I was more drawn by Woody Harrelson as Haymitch, who is just so fun on screen. He's in the zone when he plays these crazy characters. Mira: He was great. I liked what they did with his character, seeing him bidding for sponsors, convincing Seneca Crane not to kill Katniss. I'm intrigued about how they'll handle him in the next movie, when they go more into his background. Peter: All right let's wrap this up: any final thoughts you want to say? Peter: But it’s a good point. As a piece of entertainment, it was certainly diverting, and I'll be at the next one. It however didn't draw me to read the books, the way you are making me curious now. Mira: I think the reason why it annoyed me less than the Harry Potter adaptations was that the movies tried to be deep while still diverting away from the books, which never worked for me, whereas this did try to capture the spirit of the books. It was a little on the shallow end, but it wasn't completely unsatisfactory. Peter: Right, we've spoken before about how I enjoyed the Harry Potter movies for their tangential qualities from the source material, which put you into pure rage. Final question then Mira: will you be Katniss to my Peeta? Mira: Hahaha. I think that's your girlfriend's job. 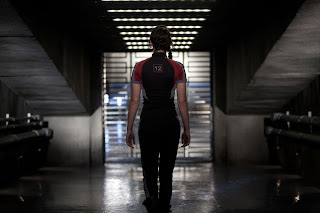 But I think if more girls aspired to be like Katniss rather than an unmentionable idiot who we saw in the previews (ed. Note: the trailer for Breaking Dawn Part II), the world would be a better place.